Centre Manager Kylie Shirdon, students Harry Kauffmann, Zavier Wallace, Principal Judy Elks, Northern Tablelands MP Adam Marshall, Maya Kaufmann, Mariah Carlon, Jesse Gardner and Justin Redmond. 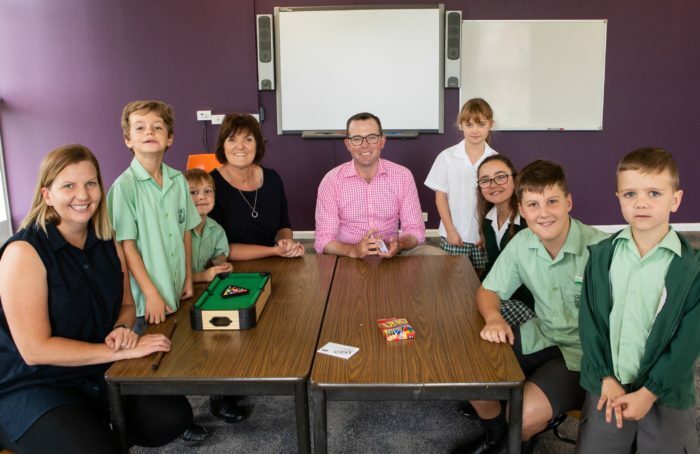 MEMBER for Northern Tablelands Adam Marshall last week visited the newly-opened before and after school hours care facility, located at St Joseph’s Primary School – the first of its kind for the Uralla community. Mr Marshall joined Principal Judy Elks and the centre manager Kylie Shirdon to inspect the facility and meet some of the children and parents already taking up the new service. Mr Marshall said the State Government provided a $30,000 grant from the Before and After School Care Fund, which was introduced to help deliver 45,000 additional outside school hours care (OSHC) places across NSW. “This is a terrific initiative and one that has been sought after in Uralla for many years, and I commend St Joseph’s Primary School and its principal Judy Elks for taking the plunge,” Mr Marshall said. “I know that some families from Uralla and the district have, due to work commitments in Armidale, enrolled their children in schools away from their home town due directly to the lack of any out of school hours supervision. “This centre offers care 7am to 9am and then from 3pm to 6pm, Monday to Friday during school terms for any student who attends any local school. This government’s one-off funding meets the initial costs of establishing and fitting out centres and the Before and After School Care Fund. Mrs Elks said she welcomed the new service. “We, at St Joseph’s, are so happy to be able to provide the facilities for this service so that it can be available to the whole community of Uralla and the surrounding area,” Mrs Elks said. “It is exciting to be able to support parents in this way by providing before and after school care for their primary school children. Working hours are not always easy to fit in with school hours.